Then the wind turned and drove the ship southward through seven days, and they came to a great rock in the sea, and the sea breaking over it. And on the rock was sitting a wretched ghost, naked and in great misery and pain, for the waves of the sea had so beaten his body that all the flesh was gone from it and nothing was left but sinews and bare bones. 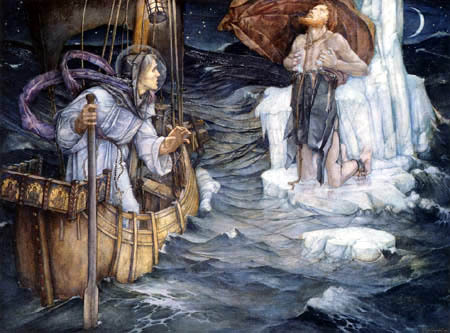 And there was a cloth tied to his chin and two tongues of oxen with it, and when the wind blew, the cloth beat against his body, and the waves of the sea beat him before and behind, the way no one could find in any place a more wretched ghost. And Brendan bade him tell who was he in the name of God, and what he had done against God and why he was sitting there. And Brendan said, “With the help of God we will protect you through the night. And tell me what is that cloth that is hanging from your head,” he said. “It is a cloth I gave to a leper when I was on earth, and because it was given for the love of God, it is hanging before me. But because it was not with my own pence I bought it but with what belonged to our Lord and his brothers,” he said, “it is more harmful to me than helpful, beating very hard in my eyes. And those tongues that you see hanging,” he said, “I gave to the priests upon earth and so they are here and are some ease to me, because the fishes of the sea gnaw upon them and spare me. And this stone that I am sitting upon,” he said, “I found it lying in a desolate place where there was no use for it, and I took it and laid it in a boggy path where it was a great comfort to those that passed that way; and because of that it comforts me now, and there are but few good deeds I have to tell of,” he said. But Brendan laid orders on them not to annoy him that night, and they cried horribly and went away, and with that Judas thanked Blessed Brendan so mournfully that it was a pity to hear him. And on the morning of the morrow the devils came again and cried out and scolded at Brendan. “Away with you,” they said, “for our master the great devil tormented us heavily through the night because we had not brought him with us; and we will avenge it on him,” they said, “and he will get double pains for the six days to come.” And then they turned and took away with them that wretched one, quailing and trembling as he went. But Paul said, “You yourself are better than myself, for God has showed you more of his hidden things than tar any other.” And he told them his own story and how he had been fed by an otter through forty years by the grace of God. And then the two blessed men parted from one another and there was sorrow enough in that parting. Mass. And when the Mass was ended the fish began to move and he swam out very far into the sea and there was great terror on the brothers when he did that and they being on his back, for it was a great wonder to see a beast that was the size of a whole country going so fast through the seas. But by the will of God the fish set them down in the Paradise of Birds sound and whole and left them there and went from them. And they were well pleased to be in that place and they spent their time there till after the Trinity as they had done before. And after that they took their ship and sailed through forty days eastward. And at the end of the forty days there came a great shower of hail and then a dark mist came about them, and they were in it for a long time. Then their Helper came to them and said, “Let you be glad now and hearten yourselves for you are come to the Land of Promise.” Then they came out of the dark mist and they saw to the east the loveliest country that any one could see. Clear it was and lightsome, and there was enough in it of joy, and the trees were full of fruit on every bough, and the apples were as ripe as at harvest time. And they were going about that country through forty days and could see no end to it, and it was always day there and never night, and the air neither hot nor cold but always in the one way, and the delight that they found there could never be told. Then they came to a river that they could not cross but they could see beyond it the country that had no bounds to its beauty. Then there came to them a young man the comeliest that could be, and he gave them all a welcome, and to Brendan he showed great honour and took him by the hand and said to him “Here is the country you have been in search of, but it is our Lord’s will you should go back again and make no delay, and he will show you more of his hidden things when you will come again into the great sea. And charge your ship with the fruit of this country” he said; “and you will soon be out of the world for your life is near its end. And this river you see here is the mering,” he said, “that divides the worlds, for no man may come to the other side of it while he is in life; and when our Lord will have drawn every man to him, and when every man will know him and be under his law, it is then there will be leave to see this country, towards the world’s end.” Then Brendan and his comrades did not fast from the fruit, but brought away what they could of it and of precious stones, and put them in their ship and went away homewards, and sorry enough they were to go. And they sailed home in their ship to Ireland and it is glad the brothers they had left after them were to see them come home out of such great dangers. And as to Brendan he was from that time as if he did not belong to this world at all, but his mind and his joy were in the delight of heaven. And it is in Ireland he died and was buried; and that God may bring us to the same joy his blessed soul returned to!